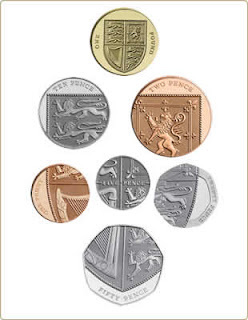 Last year the Royal Mint launched new coins that had been designed by a competition winner Matthew Dent (whose website is well worth a look by the way). 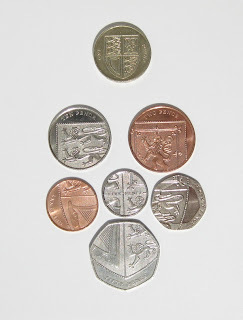 The coins are based on the Shield of the Royal Arms, each with a fragment that shows the whole when they're placed together as a set. I LOVE the design, and have been collecting the coins for what seems like an age... and finally here's my complete set, which I will never spend unless absolutely desperate! !